ExpressVPN is an established VPN (Virtual Private Network) service provider that promises speed, ease-of-use, and best-in-class customer support. With over 1,500 servers, 145 server locations in more than 100 cities worldwide, 256-bit encryption, and guaranteed log-free browsing, Express also offers top-notch privacy and security and wide device and operating system support. ExpressVPN’s pricing policy is as simple as it gets. You can choose to pay month-by-month, at $12.95 per month. Another option is a 12-month subscription with three extra months free for $6.67/month. Or you can choose from a 6-month subscription for $9.99/month. The only difference between the three options is the length of your commitment. Whichever you go for, you can always take advantage of the 30-day money-back guarantee if the service doesn’t live up to your expectations. This is important, as ExpressVPN doesn’t offer a free trial. Whether your main concern is protecting your privacy while you browse the internet, or you want to be able to access websites and services that are blocked in your country, ExpressVPN aims to provide you with everything you need, all wrapped up in a friendly package that takes minutes to set up. Highly optimized servers promise unthrottled speeds, which should mean no problems in streaming HD video and music from services like HBO Go and Spotify. ExpressVPN has 136 servers across the globe, including numerous options up and down the East and West coasts of the US, making it easy to find a proximate server for streaming US-only media content, wherever you are in the world. ExpressVPN has all the main bases covered, including 256-bit SSL encryption, a good range of VPN protocols, and a guarantee that no browsing logs are kept. You get support for Windows, Mac and Linux, Android and iPhone, as well as support for most major gaming and media devices, including PS4, Xbox, Chromecast, Apple TV and many more. You can use ExpressVPN on three devices simultaneously. ExpressVPN is one of the simplest VPN services to set up and configure. The software is straightforward and cleanly designed, and dedicated mobile apps make it a breeze to get running on your phone or tablet. While all reputable VPN services offer good privacy and security protection – after all, that’s one of the main selling points – ExpressVPN is second to none in this regard. It offers a wide range of VPN protocols, including OpenVPN UDP/TCP, L2TP/IPSec, SSTP and PPTP, to ensure anonymous browsing. 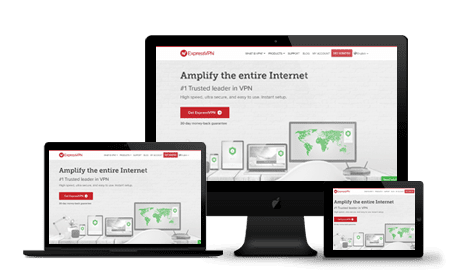 And all traffic between your device and the ExpressVPN servers are protected by powerful 256-bit SSL encryption, which should be sufficient to hide your activities from spying governments and criminals alike. You can count on this level of protection, whether you’re using your computer, mobile phone or tablet, and even on a public wifi network. Beyond that, ExpressVPN guarantees that no logs are kept of your browsing history and that it will not share your private information with third parties. As a logless VPN, ExpressVPN keeps no activity logs or session data, so there’s nothing to connect you to your browsing activities. ExpressVPN also has split-tunneling available for its Mac application, to add an additional level of privacy for users. You can even pay for your subscription by Bitcoin if you’re looking for an added layer of anonymity. If there’s one area where ExpressVPN really shines, it’s in the speed and quality of their customer support. You can contact support by phone or email 24/7. But we love the live chat support. When I asked about setting up VPN on my Netgear router I received a response within 15 seconds. Not only was the reply almost instantaneous, it was accurate and helpful, and also included links to the relevant tutorials on the site. While we’re on the subject it’s only fair to draw attention to the excellent VPN tutorial section, which provides clear but comprehensive guides for setting up ExpressVPN on almost any OS or device you could imagine, including routers, games consoles, and eBooks. It’s easy to overlook support quality when considering purchasing a product but doing so can lead to major regrets if things don’t go smoothly. This is especially true of VPN services, where even tech-savvy consumers can find themselves lost when attempting a more complex set up. If your main concern is anonymity or sidestepping censorship this may not be your key criterion. But if you plan on using your VPN to access streaming services that aren’t offered where you live, then this is a crucial consideration in choosing the right VPN provider. ExpressVPN claims to offer “unmetered bandwidth and speed,” so this shouldn’t be an issue. That’s the promise. So how did it perform? While there was a noticeable drop in speed, the service was still plenty fast enough for most people’s needs. A quick test using a UK-based server had HD video up and running within seconds. The same was true for our mobile test. In fact, we downloaded the app, set it up and had it working in about 3 minutes! Set up and configuration is a real area of strength for ExpressVPN. If you’ve been meaning to set up your own VPN but keep putting it off because you’re scared it might be too complicated, then we can put your mind at ease. Setup couldn’t be simpler with Express. Once you’ve subscribed to a plan, you’ll receive an email with a link to the software download page. The installation process is a simple click-and-go affair. Once the software is installed and you open the client for the first time, you’ll be presented with an option to immediately connect to a recommended server. Easy as that, and you’re all set up. ExpressVPN also offers browser extensions for Chrome and Firefox, so users can control their ExpressVPN app remotely. You can only use the browser extensions with the ExpressVPN app. Of course, you can browse the various servers on offer and save the most useful ones to you in a favorites list. There’s also the option to select a specific VPN protocol for your connection. If you don’t manually choose the protocol, the software will automatically default to the best option for you. In terms of the ExpressVPN mobile app, we tested the Android version, and it offers all the same functionality as the desktop client, just optimized for touchscreens. When it’s running, you’ll see an icon in your status bar. You can quickly access server and uptime information from the notification menu. ExpressVPN really lives up to its name when it comes to usability. There may not be enough bells and whistles for power users, but the rest of us get a clean, intuitive interface that makes setting up VPN connections a one-click (or one-touch) process. It’s easy to recommend ExpressVPN. It has a solid range of VPN protocols, comprehensive device support, streaming-friendly connection speeds, and offers strong privacy and security protection. Not only that, it makes setting up and using a VPN as intuitive and painless as can be. Along with the super responsive and helpful customer support, these features make it the ideal VPN service for the average internet user.